I will start this post off with a big thank you to everyone who entered out contest. We had a great turnout and I want you all to know that Jeremy and I really appreciate every single one of you. For Real. You guys are the reason why we created this blog. We wanted to touch base with other great BOTL and share our experiences and through the success of this blog that we attribute totally to you, we have been able to do so. So, let’s to it shall we? Both of you guys shoot your full name, address, and phone numbers to [email protected] and we will see that these get sent out shortly. Again, thank you guys to all who have entered. We are going to try to do many more contests throughout the year to reward you guys for all your support. Now to this week’s review. I’ve always been big on A.J. Fernandez’s cigars. Almost everything that comes out of their factory is golden so I couldn’t wait to light up their newest offering, the San Lotano Bull. The Good Stuff: You must be living under a rock if you aren’t familiar with A.J. Fernandez’s San Lotano line by now. This was a line made by A.J. to celebrate brick and mortar shops and for a while were only available in store, no mail order. I know that has changed for some of the line now, but the quality of these sticks have always been the same. The Bull is the newest release in the San Lotano line and was made to showcase a much fuller and much more premium experience than other blends in the San Lotano line. 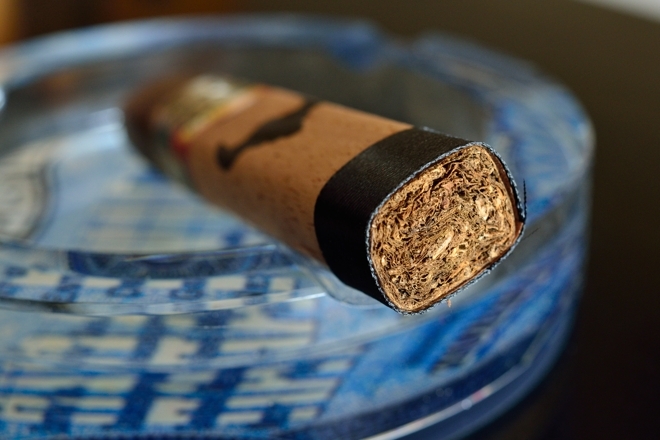 The Bull is available in 3 box-pressed sizes: The Robusto (5 x 54), the Toro (6 x 54), and the Torpedo (6.5 x 54 Belicoso). The Bull comes in boxes of 10, and will run you from $9.60 to $10.20 a stick. They are available now. Big thanks to Spencer Drake from A.J. Fernandez for sending a few samples our way. Prelight: The San Lotano Bull starts out with a beautiful, consistent, dark brown wrapper hidden beneath a sleeve of cedar that has a bull’s head printed on the front and a black ribbon wrapped around the foot. The wrapper is very tough and hard carrying some darker brown webbing and only a few smaller veins. The leaf is seamless heading up to the round double cap. The boxpress on this cigar is a bit soft making it incredibly comfortable in both the hand and the mouth. 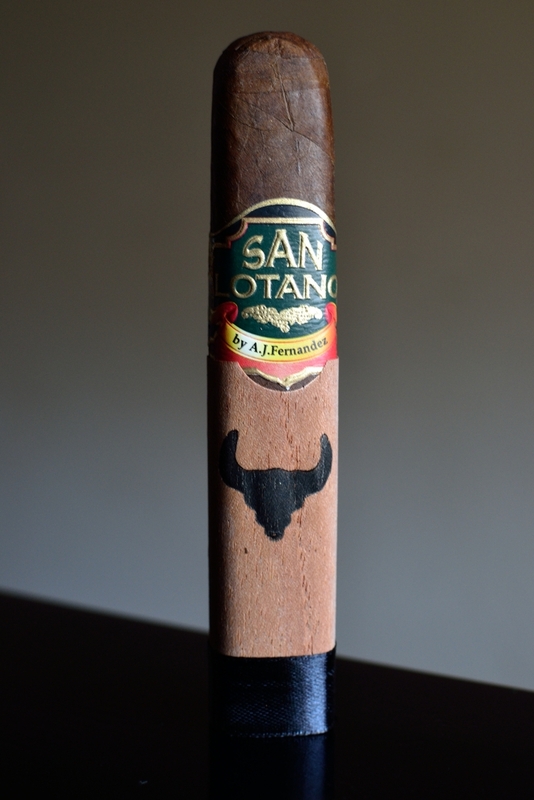 The San Lotano Bull is polished off with the standard San Lotano orange, yellow, gold and green band that we have grown to expect from the line. 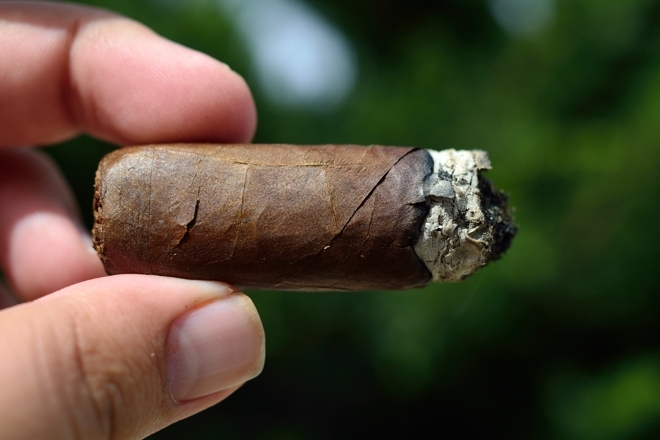 The entire cigar is incredibly firm and stiff to the touch. The wrapper gives off a real rough toothy texture. The wrapper on the Bull screams of spice and cedar while the foot of the cigar carries a much more realistic tobacco aroma. The cap cut clean and easily using my Palio double bladed cutter. The cold draw kicks out some nice spice, cedar, and chocolate flavors. 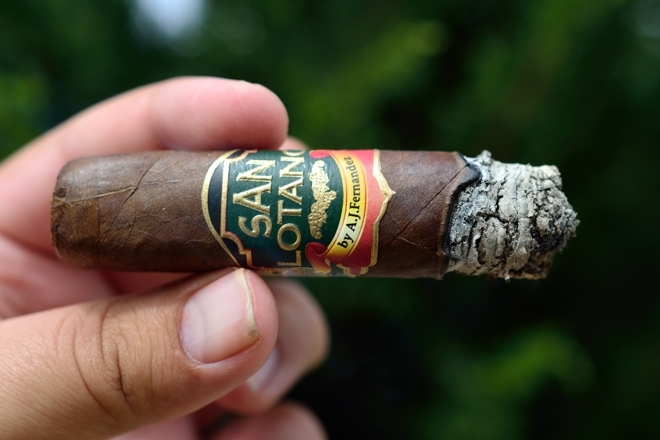 First Smoke: San Lotano’s Bull didn’t quite start out with the pepper boom I was expecting. Instead the Bull lead in with some real nice spice, lots of cedar, cinnamon, chocolate and a touch of sweetness over some natural tobacco. The spice in the mixture is really sharp and dominant pairing incredibly well with the strong cedar flavors. The draw on the Bull is perfect. Each puff is pumping out a huge cloud of thick, white smoke. The burnline is a bit wild on one side, but not cause for concern yet. The ash left behind is very well compacted and white in color. It held on for about an inch before falling into my ashtray. Halfway There: As I continue into the second third of the San Lotano Bull, the spice has started to succeed a bit while the chocolate has really ramped up and the cedar is still there. I am also starting to pick up a bit of tartness from the wrapper. The burnline is still a bit wavy but I have yet to have to pull out my lighter. The retrohale is absolutely smooth with some soft spice and cedar and tons of chocolate. I am feeling absolutely no nicotine at all at this point. Finish: The subtle chocolate flavors have really taken over the profile in the final third of San Lotano’s Bull while a really deep, black cherry has creeped in. The spice and cedar are still in the mix too creating an awesome finish to a great cigar. The burnline has completely corrected itself in the final third and had been trying hard to do so the entire experience. It took me about an hour and half to take this one down and I never needed to pull out my torch the entire time. I am feeling a very slight nicotine kick and encountered absolutely no harshness as I took this bad boy down to the nub. Overview: It’s hard to find something that didn’t live up to the San Lotano expectations in the Bull. The construction was great, the flavors were bangin’ and the draw and burn were spot on. 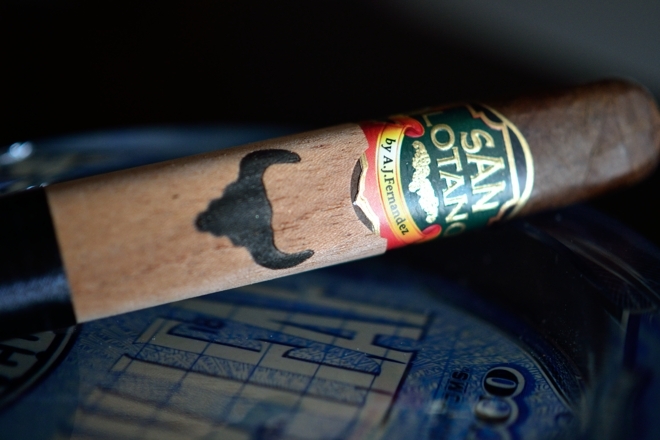 I actually probably enjoyed the San Lotano Bull more than I liked the Connecticut, the Maduro, and the Habano, but not as much as I enjoyed the Oval line. That being said, it falls perfectly in the portfolio where A.J. Fernandez wanted it to. 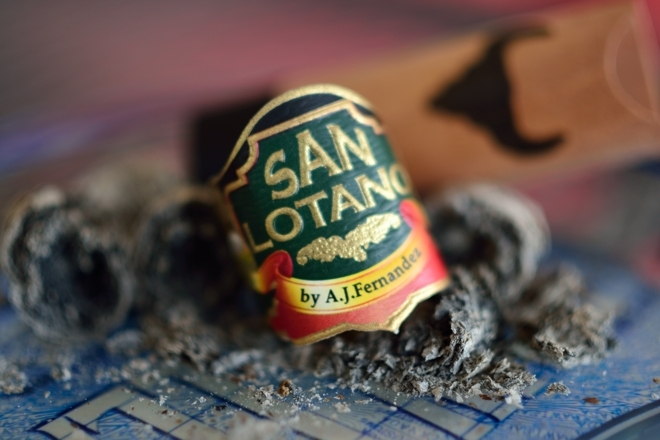 A more premium San Lotano. While the price point is steeper than you normally expect with the standard San Lotano lines, it’s pretty easy to justify. The fact that these come packaged in 10 count boxes vs. 20 also makes it much easier for me to declare them box-worthy. 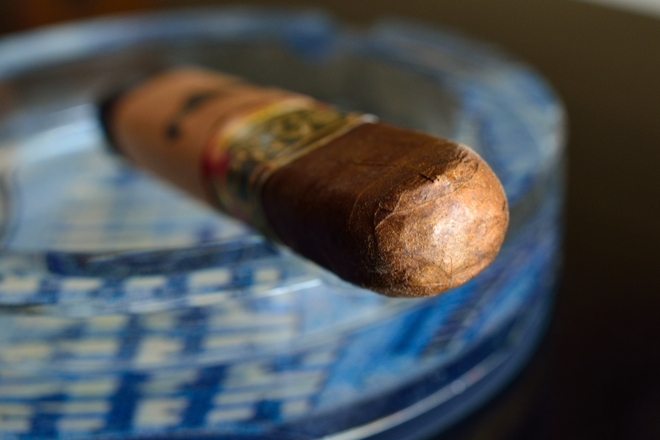 It’s a great cigar to have in your daily more premium rotation that won’t completely break the bank. 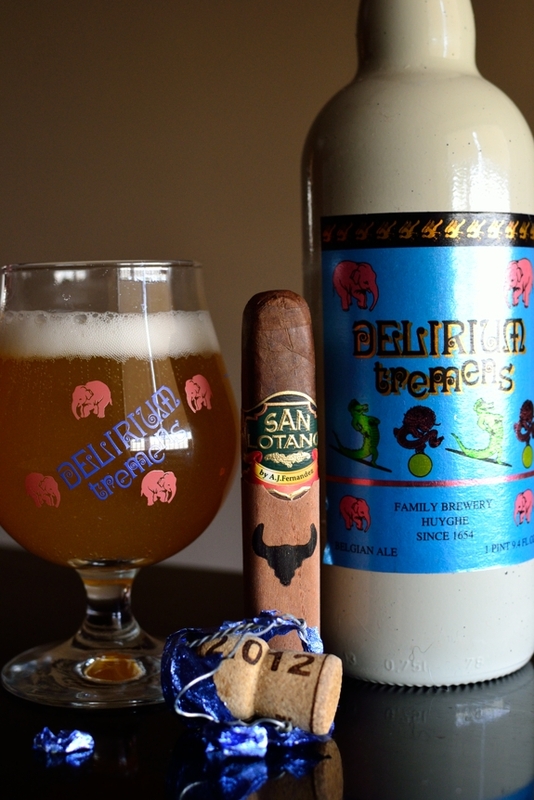 Pairing: For a very long time Delirium Tremens has been a staple of beers located in my arsenal. This beer seems to fit every occasion, every mood, every season, and every pairing. Brewed at the Brouwerij Huyghe in Belgium, this 8.5% Pale Ale leads off with some incredible fruit and bitter notes, finishing clean with some subtle spice, and clove. It’s got some deep flavors that pair well with even the highest bodied cigars while the overall experience is subtle enough not to overpower the mildest of pairings. The spice in particular stood out to me in this pairing as it matched up almost identically to the spice found in the Bull. Along with the spice the fruit in the beer really helped me pick out the cherry flavors I took from the final third of the experience. This beer carries a bit of a higher price tag (Around $12 a bottle) but can be found very easily and will never disappoint. I know how much you love the ovals…me too!…was curious how this one would compare…sounds like a must try…was worried about the strength but sounds manageable…thanks for the review Tony! The Oval line sports a much more complex and bolder experience in my opinion. With the Oval I find it tough to pick out all the distinct flavors since there is just so many of them. That’s not a bad thing at all. But the Bull, while having bold flavors, has deeper, more rich flavors that you can pick apart much more easily. That’s the biggest difference between the Bull and the other San Lotano lines. The flavors are much more dominant while there aren’t as many in there as with the Oval. As far as power goes, it wasn’t a strong cigar at all. 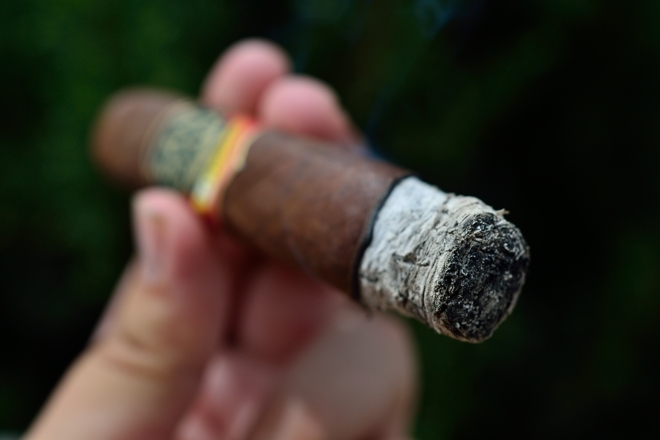 There was a bit of strength, but not much more than your average medium/full strength cigar. I agree with Paul. I was thinking that something named The Bull would be much stronger, but it’s good to know that it isn’t. Thanks for another great review, and congrats to the winners. That’s one nice looking cigar – love that cedar sleeve. Sounds like a fantastic smoke from start to finish. Right? I thought the same thing. It almost looks like it belongs in Texas 🙂 Hope you’re doing well! Great review! It’s a shame no one in el paso carries the bull yet. Maybe spec’s will get some. The same goes for boutique brands, I have to do all my ordering over the Internet. I’ve recommended a certain cigar shop in el paso to carry some awesome boutique brands but i won’t mention his name. OK I’ll give u a hint it’s the same as yours. Haha any who i don’t think anyone can tell him anything because he thinks he knows it all and will act snobbish. haha I know exactly who you are talking about ;p soon man, I hope. Spec’s does do an awesome job stocking the San Lotano lines.